Joe Jim Newby was born in Collbran, Colorado on April 2, 1935, to parents Howard and Ida Newby. He married Helen Newby on February 12th 1966 in Las Vegas, Nevada. 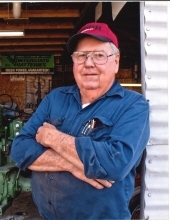 Jim loved antiquing or taking camping trips with the family, and most of all his antique tractors. He was a strong family man and was happiest when family was present. Jim had a strong work ethic, work was his number one pastime. In Jim's words everyday was a work day. He was never idle and when he wasn't working he wanted to be entertained. Jim was predeceased by his beloved wife of 52 Years, Helen, his parents and his Sister Donna McGehee. He is survived by his children, Melva and her husband Kenneth Rossen, Ricky Howard and his longtime girlfriend Jackie Patterson, Jimmy Newby and his wife Lori, Jerry Newby and his wife Lisa; grandchildren Mitzi Luna, Karla and husband Charles Kim, Stephanie Howard, Julie Hansen, Amy and husband John Hamilton, Joseph Talluto, Dustin Newby and Matthew Newby, His sister Sue and husband Chuck Nelson, 14 great grandchildren and 2 great, great, grandchildren. To send flowers or a remembrance gift to the family of Jim Newby, please visit our Tribute Store. "Email Address" would like to share the life celebration of Jim Newby. Click on the "link" to go to share a favorite memory or leave a condolence message for the family.